This classic hummus recipe requires just 4 ingredients. Serve with crisp fresh veggies or toasted pita bread. Hummus makes an easy and delicious snack but it can also be used to elevate a standard sandwich or wrap. Process ingredients in food processor until smooth. 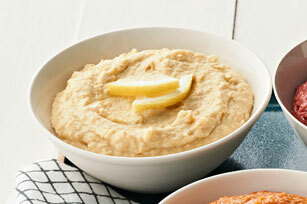 This easy-to-make hummus can be prepared ahead of time. Refrigerate up to 3 days before serving. For a touch of heat, stir 1/8 tsp. cayenne pepper into prepared hummus. Prepare as directed, using Kraft Extra Virgin Olive Oil Italian Sun-Dried Tomato Dressing, and adding 1/2 cup chopped drained jarred roasted red peppers to ingredients in food processor before processing until smooth.